The Anaphylaxis GUIDELINES Pocket Guide is endorsed by the American College of Allergy, Asthma & Immunology (ACAAI) and the American Academy of Allergy, Asthma & Immunology (AAAAI) and reflects the latest ACAAI and AAAAI recommendations. 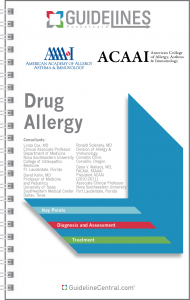 This practical quick reference tool contains diagnostic and assessment strategies for all categories of allergens, evaluation and treatment algorithms, and comprehensive treatment and prevention recommendations. The American Academy of Allergy, Asthma & Immunology (AAAAI) is a professional organization with more than 6,700 members in the United States, Canada and 72 other countries. The American College of Allergy, Asthma and Immunology (ACAAI) is a professional association of more than 5,700 Allergists/Immunologists and allied health professionals. The definition of anaphylaxis has, to this date, eluded precision. a decrease in blood pressure alone after exposure to a known allergen. Despite the apparent success of these definitions of anaphylaxis, identification of patients who present with atypical anaphylaxis remains a problem. The underuse of epinephrine in the treatment of anaphylaxis is to some degree understandable if the correct diagnosis is not made. Better recognition of atypical or unusual presentations of anaphylaxis should intuitively lead to greater use of epinephrine and perhaps even a decrease in anaphylactic morbidity and mortality. owing to vasoactive mediator release from mast cells in the heart. Therefore, it should not be surprising that anaphylaxis can present with prominent cardiac symptoms, such as chest pain in children and adults, electrocardiographic changes, and even myocardial damage. Abdominal symptoms can also be present as a manifestation of anaphylaxis. These may include nausea, vomiting, diarrhea, and cramping abdominal pain. a Data were derived from the following references: Lieberman P, Nicklas R, Oppenheimer J, et al. J Allergy Clin Immunol. 2010;126:477-480; Wood R, Camargo CA, Lieberman P, et al. Ann Allergy Asthma Immunol. 2012;109 (suppl):A20; and Boyle J, Camargo CA, Lieberman P, et al. J Allergy Clin Immunol. 2012;129 (suppl):AB132. Substance P, vasointestinal polypeptide hormone, urokinase A, pancreastatin, etc. Atopy It is clear that atopy increases risk because patients with atopy are at risk for food allergy, but they also appear to be at risk for events in general. For example, they are at risk for events owing to the administration of radiocontrast material.